While stickster was in the Boston area this week, we collaborated on some new design ideas for www.fedoraproject.org and for get.fedoraproject.org. This is a very simplistic design but the basic idea is you have a scrollbox of screenshots you can click through and get descriptions of. The idea behind this is to be a rotating widget that shows how Fedora fits into your life. Some ideas on how to do this include talking about music, photos, chat, email, browsing, etc. and mention the tools used in each, linking out to a page of more details on each topic. This particular mocked up one focuses on listening to music. This widget is meant to operate similarly to the previous one – there’s a set of different static content that gets loaded into it on a rotating basis. The content here focuses on what makes Fedora different than other operating systems. You can do this in Fedora! Another rotating set of content to show real-life Fedora users and talk about how they use it. P.S. – As Craig and Bob reminded me to point out, we’re not going to actually use stock photo imagery in the real site. That’s why we need YOUR photos to make this redesign a success. 🙂 Drop me a comment here if you’d be willing to help us fill the site with photos of actual Fedora users, even better, if you’d be willing to be interviewed for one of the user profiles or have an idea for a project! « Help us Brainstorm to make Fedora Community better! These look really slick. Well done! 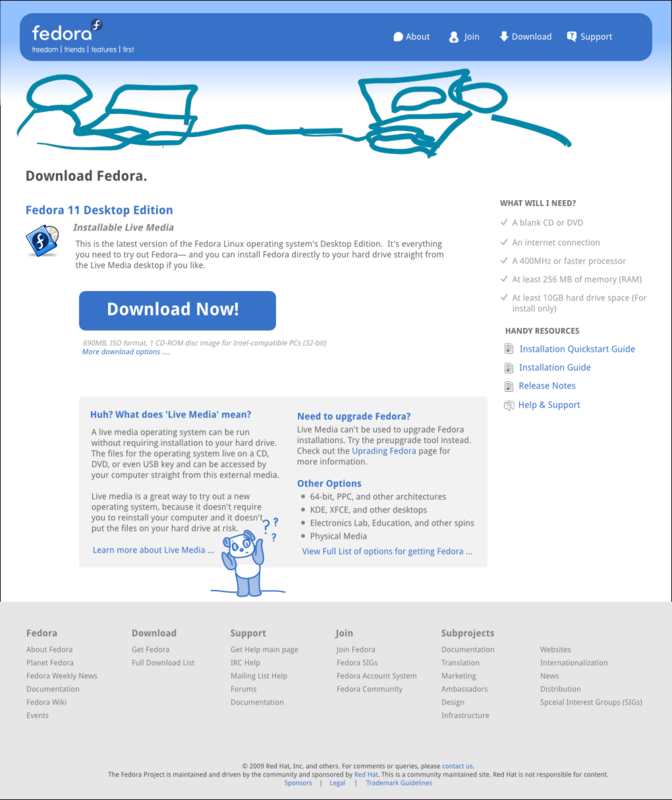 I really have the current Fedora website, especially the download page, along with the Debian and FreeBSD websites. I really hope this website will happen soon, it’s really slick and very informative/meaningful compared to the websites of other Linux distros etc, nothing like Kubuntu’s silly website, giving half-baked explanations like “it’s a Linux distro based on Ubuntu” or something like that. Keep up the good work! Hopefully the distro itself will become less silly and less bloated with crap. Looks great.. But if the clouds and mountains artistic pic should have been a real one from the raw nature. That way the page would look a bit of real and shiny..
Apart from that, the page looks awesome.. I think all major distro sites are in need of a serious, comprehensive redesign. I made a design for ubuntu.com that I was going to contract out to a web developer friend of mine, but since I work at BK it’s best if these issues simply gain more general awareness. The first impression people have of your OS isn’t your OS. It’s your website. Make it as good as you possibly can. Also, do it like Sun and have virtual images people can log into to try it out online for themselves. Hi Ethana2, having virtual images to try out is a great idea! Agree with all above, very slick ideas. I really think hip/modern graphic themes with more content geared toward users who don’t necessarily have a clear idea of what Linux is would really help Fedora, and maybe Linux in general, from the userbase point of view. I really like the way website gets better and better – first with the new community page now with this. The slickness of the page was already acknowledge but I was just asking myself if the bear is the mascot of Fedora as the mascot page on the wiki doesn’t say to have any winner :). Hey MStoykov, I’m going to try to make the panda the mascot 😉 I love pandas! You did a great job Mairin, @zenwalker I think that the clouds and the nature looks way better then a real pic. I’m pretty sure I’ve left messages here before telling you what a fanboi I am… but here I am again! If I have to pick a minor nit, I’m not sure the login screen is that interesting. But basically I love it. Pretty sure the “Get Fedora” page will cause ruckus with the same old opinions being trotted out, but I think these pages all look like they work together brilliantly. Looks awesome! I’ve always thought the Fedora website left a lot to be desired. I think its great. The simple content focusing on differences is good and I like the tour widget. I have one significant gripe though, the stock photos are too corporate. They don’t say ‘community driven Linux distro’ to me. If Shelia Brown is a real person then use a photo of her, if she isn’t real then use someone who is? I’ve just had another thought related to Matthew’s comment. I agree it would definitely be much more approachable to users not familiar with Linux… but does that mean we shouldn’t mention GNU and Linux? There isn’t a single use of either term on the entire page. As someone who does know what they mean, I would walk away from a distro. website which didn’t give them credit. I am hoping, that as this design progresses, that we can source photos of actual Fedora users and contrbutors (so far I have photos from FUDcon Boston 2008 http://www.flickr.com/photos/mairin/sets/72157612400838690/ and some photos from FUDcon Berlin 2009 http://www.flickr.com/photos/mairin/sets/72157620486080147/) but I expect I’ll need everyone’s help in getting photos of more Fedora users & contributors. By the way 🙂 If you have any photos you’d like to contrbute or know anyone who’d like to be a website model 🙂 let me know. To your other point, about mentioning GNU & Linux, I do think it’s a very valid point and I think probably that’d be approprate for the ‘About Fedora’ page. Maybe it’s not the right approach, let us know, but Paul and I decided to focus to make the top priority of the front page to encourage complete n00bs to hit the download key – thus the little projects-you-can-do widget and what-makes-us-different and how-it-fits-into-your-life widgets. I think we want n00bs to want to download Fedora first, and once we hook them in we can gently introduce them to more of the details about what Fedora & Linux are, where they come from, etc. etc. Does this seem reasonable to you? We haven’t mocked up the ‘About Fedora’ page yet but I’ll certainly take a stab at integrating your suggestion into that page. 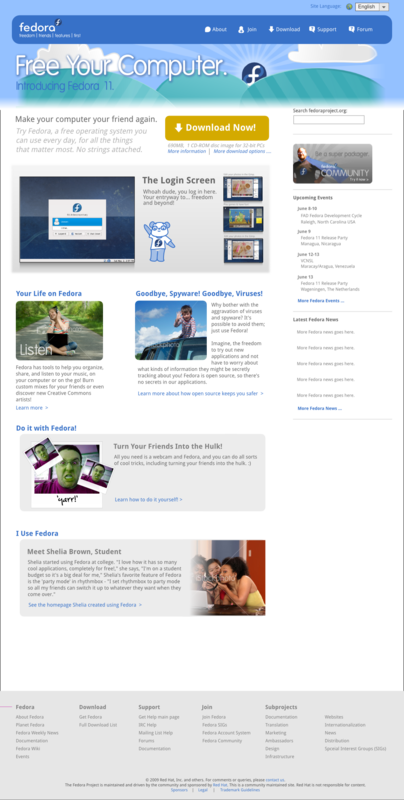 “Want an advanced platform for your PC? Fedora will give you that, and it will make you feel better about yourself because you will be using a community developed GNU/Linux based operating system distribution! (What ever one of those is)”. I think there is a fine balance to strike between sounding smarmy and baffling people. Which none of the examples below really manages all that well and I don’t feel fit to attempt. I don’t think that Linux distros should veer towards smarm for the sake of acceptability – does gloss and polish sell? When we asked what you wanted in a PC, you told us to make it simpler and easier to use. The world’s most advanced operating system. Finely Tuned. 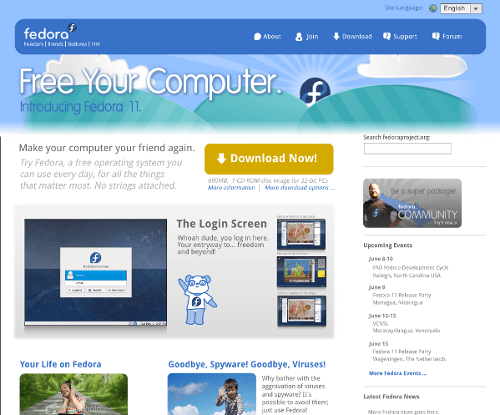 Fedora is a Linux-based operating system that showcases the latest in free and open source software. We produce Gentoo Linux, a special flavor of Linux that can be automatically optimized and customized for just about any application or need..
SUSE Linux Enterprise 11 is the most interoperable platform for mission-critical computing – both physical and virtual – from the desktop to the data center. I like colors (much better than present site) and easy-access links on the top, but for me it’s a bit too cluttered. Maybe remove this right-side column? or is there a particular one you’re thinking of? I mean only first screen, two next are OK. I don’t understand why the use of stock photography. These people aren’t really fedora users, and I don’t think many fedora users sit in the middle of the road with headphones on. It just looks really coldly corporate and disingenuous. Also, why the focus on one tiny feature (is it Cheese, the photo app?) of one app? It’s not really a killer feature is it? Hi Bob! Craig made a similar comment above and I went into more detail there (https://mairin.wordpress.com/2009/08/08/fedora-website-design-ideas/#comment-2836) but I wanted to let you know that I absolutely do not plan to use stock photography in the real design, and if you or anyone you know who uses Fedora might be interested in helping us gather the type of photos we need of real Fedora users, please get in touch here. We could totally focus on some of the more involved & totally amazing things you can do in Fedora like manage virtual guests and migrate them between hosts, but that kind of thing takes a lot of setup and requires a high level of technical knowledge and I fear if we highlight that on a page focused towards newbies, we might draw them in to try the feature, but it might take them a lot of time to figure it out and they might give up early. Just loose the teddy bear, and I’m ok. We need enterprises interested in Fedora because that’s where things happen and that’s where the future is. No please, do not use pets animals and kids to make fedora web page to look like an advertisement for a toy shop. The design is nice, but not as a mainpage for an operating system. hey, totally nice work. A lot better than the earlier one. “Do it with fedora” sounds a little like ubuntu’s “I do it with ubuntu” marketing scheme – which sounded out rightly silly/funny(a lot of my colleagues/ friends had laughed their behinds off reading the really funny comments from digg..) No offence to ubuntu, but just my opinion. Hey Kashyap! thanks for pointing that out. Maybe we could go for a little something different. I’ll ponder on it! Let me know if you come up with anything we could replace it with as well. For gathering contributor profiles, user profiles, and generally filling out all that concept in an ongoing, scalable way … I was thinking this seems like a great job for the Ambassadors, who have been doing this sort of thing for years in an ad hoc fashion. If we had a regular set of interview questions and maybe a web form to input the answers + photos, we could enabled Ambassadors to populate the database from e.g. a show floor. It would be pretty cool if I could do a 12 or 30 second video during a show, upload that plus the answers, and possibly have that in the rotation before very long. The ‘get Fedora’ page is a good one for having on regular display at an expo booth. Then, if show attendees were being added to the pool, they’d see themselves pop up, etc. If the redesign could include a simple process and set of tools, I’m sure the various Ambassador leaders would promote the usage. The Panda is a an awesome concept none the less and it should stay. Corporations adopt products that are suitable for people, doh! You don’t aim a project directly at a corporation, but you aim it to the people and the corporations adopt your projects that people love so much, in order to make a business out of it. Some of you people are not that bright, as you don’t get it that those images are just mockups, so Sheila Brown is probably a fictive character and the watermarked istock photos are just temporary in order to illustrate the idea. Heck, -I’m- not even sure how to do that. Last time I tried to burn CDs for a friend in Fedora, I wrecked four CDs. And yes, I know how to burn CDs. My point is not to beat up on Nautilus and Brasero, though: my point is, I think for complete newbie-friendliness, for any “Cool Task” that you present, there should be an accompanying video tutorial. Go through my music collection and burn a mix CD? Present a three-minute tutorial with Rhythmbox and show me how. Find new artists on Magnatune? Show me how that works in five minutes or less. Video presentations have the added benefit of showing -exactly- what you’re getting when you install this thing, and add an extra layer of honesty to the advertisements (Yes, you can really do something this cool, and here is how you do it in Fedora!). It shows potential users exactly how to do a task, and it is upfront and honest about the workflow required in Fedora to do it. Remember how for every feature on the OS X Leopard Coming Soon page at apple.com, they had a video preview showing it off? Like that. Show them what they’re getting. Show them the experience. Make videos a first-class part of the Fedora advertisement content. Hi Twilightomni, that’s a fantastic idea. We did mock it up to link out to some page with the steps, but I haven’t mocked up those pages yet. I think they absolutely should include videos, and I think ‘can you do this in 5 minutes or less’ would be a good metric to figure out whether or not one of the ‘projects’ we propose as something users can do with Fedora is added there or not. It could qualify, however, as an Advanced Fedora Feature. Maybe there should be a collection of those as well. (Ex., the Fedora Website could have different sections. For Users (Cool Things to Do), For Developers (Cool Technologies that Come with Fedora), For Administrators (Awesome Things Fedora Can Do That Require Advanced Knowledge). The Administrators category could be renamed… for IT, for Businesses, something like that. I think with those three categories (easy newbie stuff, developer stuff [those who use Fedora to contribute], and technical-y stuff) you can show off most of what Fedora has to offer. First off, let me say that this is a rather big improvement from what is currently used at fedoraproject.org. That much is very clear… it bright, it’s really clean, there seems to be a hint of excitement in the design (which is something that the Fedora Community does need to show off a bit more in my opinion). There is one thing that does bug me, the design of the front page does seems oddly familiar to me. Namely, it reminds me of mozilla.com mixed with mozilla.org… allot! If that was purposely done then you are welcome to ignore me, if not… then you may have to worry, since it does come off as a little un-original (as much as it may be). Still it’s nice, oh and one more thing…. Please kill to keep that damn Panda, mairin. The thing is too cute and seems to look like a great little mascot. You know what, if you toss me an e-mail… I might have something for you in a matter of days for a name. It’s not love, much, more that something like that little guy would make the distro a little more “personable” or approachable (some people are very attracted to cute things “that rot teeth”). Which last time I checked, it something we want anyway. Anywho, it does give us something like Ubuntu had with the scantly clad people wallpapers… something that other people with identity with. Panda’s (which are natural playful last time that I checked) seem to describe Fedora a bit, we are playful… dangerously so. He who will release all the goodness upon the world by opening the Fedora spins. The Design-Elements and placement within an upcoming CMS I like very much. Maybe we can put this into a Theme or pattern wich everyone can work with… (a Template maybe…). The Top-Banner I found a bit to much Teletubby Style … I miss our 4F’s a bit in there. The “Fedora fits in your life” and “What makes Fedora different?” and so on thingys I like BUT I allways have the feeling “A, I’m on the sony or HP page” 😉 Yes, I know Stock-photos, but as we “First” maybe we can shoot our own Fotos for that?! We now have our own gallery -> fill it with lots of pics… ( make a theme out of it (like Paul Hulk) and voila we have a hackergotchie-like Button-icon thingy 😉 Have fun & enjoy. Hi Henrik! Great ideas. I absolutely do not want to use stock photos in the final design – we need real Fedora users! I also think we’ll have to template this rather than doing it statically. The artwork can be worked on – I threw that together very quickly for the mockup. This is very cool, but – and it’s a big but – I’m not sure about the intended audience. 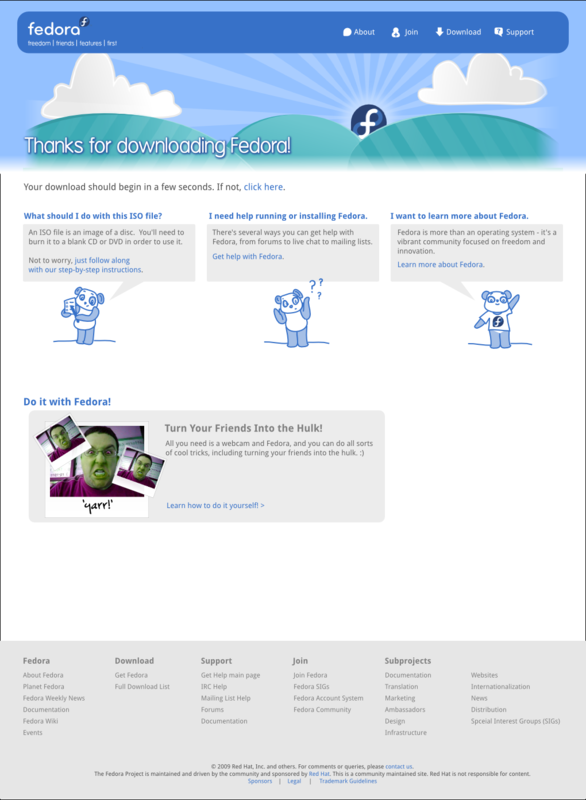 The mockups seem to be based around the ‘everyone can use Fedora’ theme. However, there are rather a lot of things about Fedora which mean it’s really not the best choice of a distribution for a non-enthusiast who just wants to do normal computer-y things. When this is pointed out, many Fedora project members tend to say ‘well, that’s not what Fedora’s for, Fedora is a developers’ / enthusiasts’ distro’. There isn’t a lot of enthusiasm within the project, as far as I can see, for spending the extra work to make it so that Fedora could be an awesome distribution for normal users. Few people support the idea of setting up a stable update path, or an LTS-type Fedora. There are other examples, I won’t go into them. Given this, our website has to have consistent messaging with what our development team is actually doing. If Fedora is going to continue to be built primarily for the benefit of enthusiasts and developers, the website needs to be designed to reflect that. Hi Adam, there was a very deliberate choice by myself and Paul to target a wider userbase than Fedora typically is used by. Why? You’ve probably seen Karsten’s community contribution pyramid (http://iquaid.org/2009/04/14/community-sets/) – the goal here is to increase the bottom portion of the pyramid in hopes of growing wider to the tip. I think right now we’re imbalanced by over-focusing on the contributor tip. I think other distros *cough cough* are imbalanced by over-focusing on the base. By no means does having a more generally user-friendly website mean that we are going towards a stable update path or an LTS-type path. Well, yes, and that’s sort of my point 🙂 I don’t think it’s a great idea to promote a distribution to a group when it’s probably _not_ actually the best distribution for most of them, just on the hopes that a small percentage of them will soldier on and become contributors. I think that’s quite arse-y to the Linux community in general, which we should think about along with our own interests. Adam, who do you propose we focus the distro towards? Developers and other highly-technical users? What design implications do you see from that? How will we grow as a distribution if we continue to preach to the choir? Just keeping the design as it is and focus on making more useful websites for packagers (I know you are working on this), making that Bugzilla UI analysis for me :), and stuff like that. Otherwise, we won’t grow our distribution by improving design of the web (and yes, I am all for as many pandas as possible), but by keeping with quality software, and making it the best distribution for developers. So, yes I don’t agree with that pyramid thing. I don’t think we’re doing any preaching. The problem (and how I’d like to solve it) is that LTS type support is something fedora-devel is not willing to do, meaning it’s dishonest to get users to use Fedora. We also don’t quite pay as good attention to certain things that cause laptops to oops a lot. We don’t test consumer laptop hardware as well as we could and publish matrixes of what parts of things computers work and what don’t (look at UNR). For Fedora to market itself to those audiences in good conscience, we must first fix those underlying issues so users who see the marketing web pages also want to tell their friends about how it just works, else we end up backfiring a bit. Yes, we need a new page redesign, but the marketing angle should … fall in later, let’s talk with the Board and try to organize Fedora-devel and the resources we can control to steer towards something like that. The classic OSS problem here is that it’s hard to tell contributors what to work on, and this kind of focus is, historically, stuff you have to pay people to work on. Folks work on what is most interesting to them and their skills, which means they do not always look after what an end user needs — unless they are in a structure that focuses them to do this. (There are many exceptions, but there’s a fair amount of truth in that). And 13 months for a certain version is not good enough for desktop users? In my experience Windows people have to to a serious clean-up or even better a reinstall sooner than that, as their computers get full or viruses and spyware. Well, My thinking is this… if Fedora doesn’t reach to groups that are the unknown willing, then simply put, it will not grown. Fedora in that same token should outreach a bit to those outside of the traditional scope of users in the broad aspect. It not naive to assume that their are people that would love to work on Fedora once shown the community around it is healthy, but to sit an do nothing to try to gather such people is a waste. Even if it turns out to be small, it better to make the active effort to each to then general audience…. they could be more willing to get involved than most (myself included) think. In addition, there are other ways for a distribution to improve its perceived “friendliness” and stability that don’t involve the long-term-service debate that pops up on fedora-list. Just plain improving the quality of the software helps. A stable upgrade process would be nice, but alas it’s not a perfect world. Then there’s also making new infrastructure that allow developers to more easily improve Fedora and lowers the barrier of entry for new developers while improving the quality of their submissions by automating trivial but tedious tasks. These are all good ways to help improve the system. Is Fedora being presumptuous by reaching to more casual users when the above improvements are still in flux/taking effect? Maybe so. But asynchronous improvement of different aspects of the distribution seem to be inevitable. You see, Mo, that’s exactly what I was talking about when I said that Fedora (apparently, it includes *you*) lives in denial about its ūbergeekiness. Matěj, I’ve been there, done that. I know exactly where you are coming from. Yet, I’m tired of Fedora being an insular community. How am I going to recruit more artists and designers (the latter desperately needed for UI and interaction design) if our community remains so off-putting to them? Well, you have to tell me … I mean in the same manner as I said below we want to make Fedora the best distro for developers and packagers, QA folks, etc., I think we want to make Fedora the best distro for people *who create* art. Something which looks like putting Fedora mostly in competition with Ubuntu (sorry, if it wasn’t your intent, but it’s the feeling I get from it) for getting all newbies won’t cut it IMHO. I don’t know what makes artistic folks want to switch to Fedora to make the difference, but is it this? Will they fall for couple of photos? I don’t know makes the artist switch to Fedora. Is it because they have best tools? Is it because they are close to upstream, so their design can have higher chance to be universally accepted as the standard one? Is it because they have the most creative community in Fedora? You tell me. And of course, I am sorry for not saying before, this *IS* very nice webdesign and the page looks nice. And yes, we need to redesign the webpage, but IMHO (and I won’t do the work, so this is just my bikeshedding) it should be oriented to different audience. Fedora doesn’t have the fame of the distro most accessible to newbies, but it has a great tradition of the strongest engineering qualities. I think we should keep the webdesign in these traditions. Actually the process I would prefer for fedoraproject.org website would be something of the googlization (or if you wish applization) … getting rid of the clutter and having just Really Useful Website (sorry, just reading Tomas The Tank Engine stories to my kids ;-)). This page you have created is very pretty, but it is yet another front page you have to go through to get to the really interesting stuff (in the same manner as the current http://fedoraproject.org) — I always start on fp.o/wiki. Why not to make this into website which would be useful for people who do the stuff? The website which would be pleasant to *use* and goo everybody dreads to tread in? Pleasant starting point (not just presentation, actually real tool) for programmer, packager, docwriter, and yes of course artist. The redesign is more than a couple of photos though. 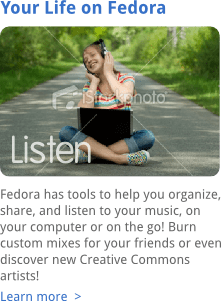 You’ll notice with the user profiles and project ideas, it’s directly associating Fedora with creative activities that link to people’s real lives, rather than techno pr0n. We can attract artists by talking about how Fedora helps them be creative, instead of talking only about geeky/techy capabilities that don’t relate to their real life. Who do we orient it to? Give me an example of a person. Do we orient it to… oh I don’t know… Paul himself? Is that the type of user we want? I’m not trying to orient it to anyone’s mom, by the way, that is not the goal. On the advisory board list, there’s been discussion about orienting it to users who are computer savvy but maybe have no previous Linux experience. Maybe this design casts a wider net than that… I’m not sure. But if we can agree on the appropriate audience we can tweak the design accordingly quite easily I think. Are you telling me Ubuntu, LTS or not, is any easier for a newbie than Fedora? They have a right to try to attract Linux newbies and we do not? That is the point of Fedora Community – to be the really useful website aimed at Fedora contributors in particular. The Fedora website should be our main gateway to reach non-contributors – it should be our main platform for marketing messages. I agree with this 100% which is why we’re focusing on making Fedora Community the first place contributors go to get to the good shiz. Indeed. I’d feel wrong leading people up a creek they really didn’t want to go down (how’s that fora mixed metaphor). Also, mascots should really be put to the elections system. We have some good software for that. The first question should be “do we need a mascot”. and sorry for typos (“I don’t know what make artists switch to Fedora…”, “… and not goo everybody dreads ….”). > Who do we orient it to? Give me an example of a person. Do we orient it to… oh I don’t know… Paul himself? I met in the last year or so pretty big number of former Ubuntu users who are leaving for Fedora. They feel like their overgrown newbie oriented distro and they would like something more bleeding edge where their effort would be more relevant for whole Linux community (yet another advantage of upstreaming everything). These kind of folks are not that much refugees from Windows, and they know very well they can make Paul green. > Are you telling me Ubuntu, LTS or not, is any easier for a newbie than Fedora? They have a right to try to attract Linux newbies and we do not? I think we have less right to promote ourselves to newbies than them (or CentOS, my black horse for newbies), because we just are more bleeding edge and so we are (and we have to be) broken more often. > That is the point of Fedora Community – to be the really useful website aimed at Fedora contributors in particular. > The Fedora website should be our main gateway to reach non-contributors – it should be our main platform for marketing messages. > I agree with this 100% which is why we’re focusing on making Fedora Community the first place contributors go to get to the good shiz. OK, so idea is that I should just ignore http://fp.o exists? 1) Fedora Community is at http://admin.fedoraproject.org/community. There are also banner ads that point to it on fpo. 4) How is Ubuntu any less bleeding-edge than Fedora’s stable repos? Well, generally developers or people who want to create something useful (and not only …. don’t know polite word 🙂 … over their yet another new distro), developers, artists, where light brokenness is not that big problem, but obsolete packages and distance from upstream are. Also better quality of the process and thus (at least perceived) higher quality (not random patches from somewhere, in-house development and fixing). > 4) How is Ubuntu any less bleeding-edge than Fedora’s stable repos? Actually, I was surprised that it actually is http://oswatershed.org/ … less Karmic × Rawhide than F11 × Jaunty, but still (and I am not sure how really relevant their numbers are). However, just from looking on broader picture I think the second comment from the top on http://brainstorm.ubuntu.com/idea/11165/ should be our badge of honor and in bigger projects it to my random thoughts follow the reality … if thinking about big components of OS (ext4, KMS in Xorg, NetworkManager, PackageKit, not mentioning BTRFS, earlier new wifi drivers in kernel), then Ubuntu was usually one or two distro releases behind (they started testing in the release which came out sometimes around when we released distro where it was default). And it is not saying, that by being more bleeding edge Fedora is better than Ubuntu — to each his own, and if you target newbies you should prefer more stable and mature code, whereas when you target developers you need the freshest one risking some breakage here and there. Well, there are some others (Linspire, Mint, Mandriva??? ), but they are either just a shadow of Ubuntu in terms of popularity, or they are Ubuntu derivatives anyway. In general i like the layouts…. for 6 year old kids. If this is the best you can come up with you might as well base it on this: http://ostiaunlobby.files.wordpress.com/2008/07/teletubbies-group2.jpg perhaps that will fit that age category even better don’t you think? Here is what i think it should look like (while roughly maintaining your layouts). Make it a little more professional. Cut the panda (although it’s cute) and specially REMOVE that super packager and that hulk frields. just childish playing what you did there and that’s what’s on fedora for years now. The site strikes as childish as do your new layout mockups. That’s it. I hope it helps improving the layouts to make them look less childish. 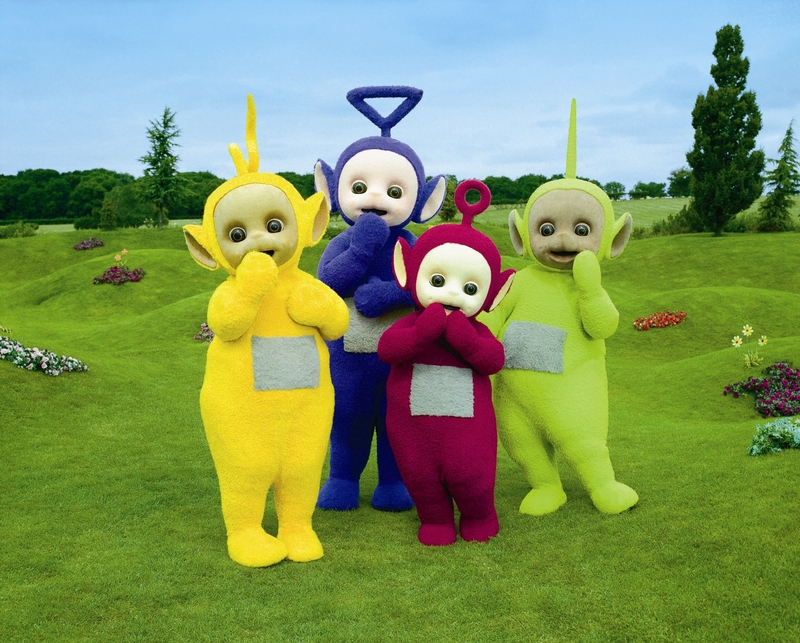 If this is the best you can come up with you might as well base it on this: h t t p ://ostiaunlobby.files.wordpress.com/2008/07/teletubbies-group2.jpg perhaps that will fit that age category even better don’t you think? The super packager banner is a banner currently in rotation right now on fedoraproject.org for the Fedora Community project. I think you realize how childish your comment is as you felt the need to hide behind anonymity. The point ‘Anon’ is trying to make is that when you try to garner a new audience or appreciation for this distro, you could (if you’re not careful enough) insult the present community of Fedora. I am no expert on linux distros, but isn’t Fedora regarded as being bleeding edge? The website mock up isn’t edgy. Also, get rid of ‘No strings attached;’ it’s really bad. There’s not a lot of comments here on the copy writing. Bleeding-edge refers to the software, not the people who use it. Normal, happy people can use bleeding-edge software, and have fun. You don’t have to be “edgy” to enjoy using software. You are applying a -development- term about the software as a -personality- term. Looks OK for me but… ¿why on earth is KDE LiveCD hidden again? How is it hidden? They’re in alphabetical order and it has a large, very noticeable KDE icon next to it? Oh you were replying to the first mockup, sorry. check the newer mockup I posted tonight. I was not disputing authority. You asked for opinions, and got some. I wasn’t alluding to any dispute of authority. You suggested we get the Fedora Board involved, I was pointing out that was unnecessary as they commissioned this design process and were the impetus for it starting in the first place. Nicu, Microsoft does have longer security update intervals, and while that is also my experience, it doesn’t require burning new media. Paul mentions Pre-upgrades in your post, and there are things we can do from an engineering perspective to improve that, though there are things Fedora still needs to improve on more before we gather thant user focus. I’ve seen the EKG numbers on how well folks on fedora-devel support the user lists for instance — not too good, and some discussions on fedora-devel that did not go as well as I’ve liked when talking about longer support intervals. Forget about Microsoft, we have our asses handed to ourselves in this space with Ubuntu and its 18 months “support”. 13 or 18 month is pretty much in the same league. Our user list is so noisy, I totally understand the developers not wanting to spend the time there. Please visite my webpage to at http://www.4createwebsite.com – For Create Website. We need to improve our official site with a design more professional and organized like in your proposal. Someday there will only be fedora and there will be much that is good upon the earth. The massive marketing and manipulation of people will fail and the truth will be known. There will be peace on earth. LOL Sorry I had this weird picture in my head of a futurescape with a giant fedora logo where coke used to be on a business trip to atlanta again. I really don’t mean to insult if it’s not the case, but your reply seems to be a pretty clever piece of spam… I may moderate it out.